Greetings. 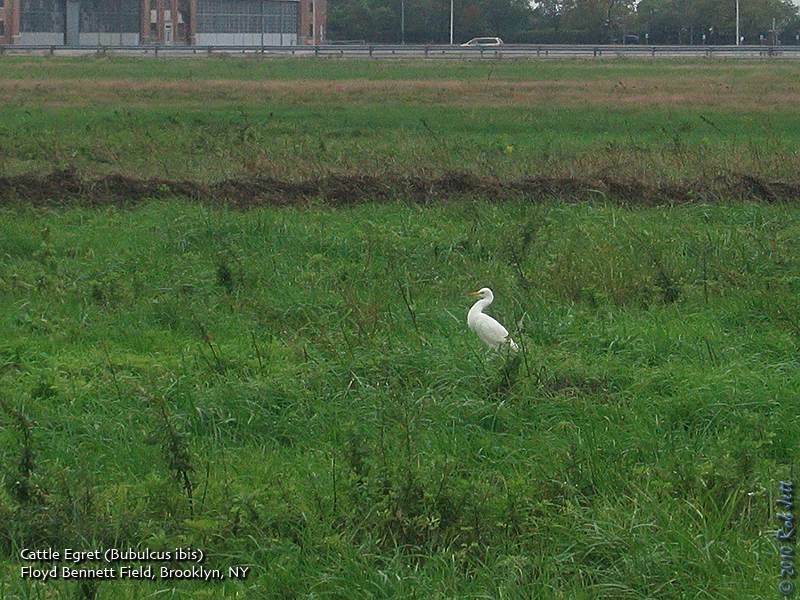 This is the New York Rare Bird Alert for Friday, October 29th 2010 at 9pm. The highlights of today's tape are MAGNIFICENT FRIGATEBIRD, FRANKLIN'S GULL, CAVE SWALLOW, BLACK-HEADED GULL, DOVEKIE, BARNACLE GOOSE and other migrants. There were several interesting birds seen during the past week but the one attracting the most attention has been the male PROTHONOTARY WARBLER frequenting the plantings and adjacent public area around the front of the New York Public Library off 5th Ave. between 40th and 42nd St. The warbler has been searching for scraps on the ground, the stone wall and the tables near the lions on the front steps of the library usually in competition with House Sparrows and Rock Pigeons. Birders talking to library locals have been told the Prothonotary has been present for a few weeks doing the same routine. 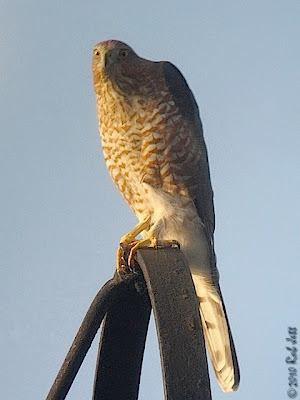 The bird was still there through Thursday evening but was not seen at all today. The good news is perhaps it figured out this migration thing. On Tuesday a little after 4pm an immature type MAGNIFICENT FRIGATEBIRD was enjoyed briefly as it flew over the Oceanside Marine Nature Study Area. The bird moving off to the west. Then on Wednesday 2 FRANKLIN'S GULLS were found. The first, a first winter bird, stayed for a short time with other gulls up on Fire Island at Robert Moses State Park parking field 5. Up to 4 LESSER BLACK-BACKED GULLS were also seen on the same lot on Wednesday. These a mix of adults and immatures. After the immature FRANKLIN'S GULL disappeared a birder searching for it found instead an adult at Captree State Park just across the bay from the Fire Island sighting. Neither Franklin's could be relocated on Thursday. Last Sunday a BARNACLE GOOSE was found in a Canada flock on Belmont Lake State Park on the north side of the Southern State Parkway this approached from exits 37 and 38. Also at Belmont that day were a HOODED WARBLER and RUSTY BLACKBIRD. The Barnacle has not been seen since. In Prospect Park in Brooklyn an AMERICAN BITTERN flew in Thursday and landed around the lake. Earlier in the week highlights at Prospect featured PHILADELPHIA VIREO and ROSE-BREASTED GROSBEAK Wednesday and BALTIMORE ORIOLE and NORTHERN WATERTHRUSH Tuesday, AMERICAN PIPIT, ORANGE-CROWNED WARBLER and a HORNED GREBE on the lake on Monday and a VESPER SPARROW last Sunday. On Sunday 2 COMMON RAVENS were spotted in southeastern Queens near the Idlewild Park Preserve. On the same day a raven appeared over Big John's Pond at Jamaica Bay Wildlife Refuge when an adult RED-SHOULDERED HAWK was also seen with it along with a single REDHEAD on the East Pond. 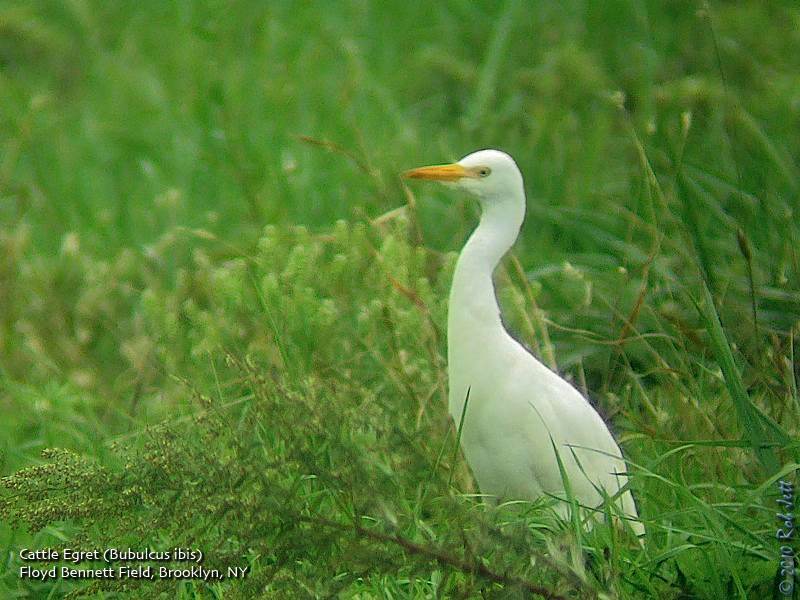 Three CATTLE EGRETS continued on Floyd Bennett Field in Brooklyn to Thursday and a YELLOW-BREASTED CHAT was noted last Saturday at the New York Botanical Garden in the Bronx with an ORANGE-CROWNED WARBLER reported at Breezy Point on Thursday. Out at Jones Beach West End a MARBLED GODWIT was still present Saturday, Sunday and today around the bar at the Coast Guard Station or across the bay keeping company with the many American Oystercatchers there. An AMERICAN GOLDEN-PLOVER appeared again Sunday on the coast guard bar with some RED KNOT and other shorebirds. Migrants at Jones Beach West End Saturday featured more PINE SISKINS and PURPLE FINCHES for the first time and also occurring were AMERICAN PIPIT, EASTERN MEADOWLARK and RUSTY BLACKBIRD. A major flight of migrants this morning along the barrier beaches, especially at Robert Moses State Park and Jones Beach West End, featured good numbers of expected seasonal migrants and an estimated 300 PINE SISKINS and 100 PURPLE FINCHES. A YELLOW-BILLED CUCKOO and a DICKCISSEL were also at West End and 2 VESPER SPARROWS were found at Kissena Park in Queens. In northern Westchester a CAVE SWALLOW was seen flying around the landfill at Croton Point Park for awhile last Saturday and across the Hudson the EURASIAN WIGEON was still around Rockland Lake State Park to Thursday. On eastern Long Island last Saturday a COMMON RAVEN was photographed in Montauk and also that day a BLACK-HEADED GULL appeared at Mecox. An interesting report of an early DOVEKIE off Georgica comes from back on the 19th. A PARASITIC JAEGER visited Montauk Point Sunday and a drake HARLEQUIN DUCK was spotted off Montauk yesterday while a CATTLE EGRET appeared today at the Mecox Dairy Farm off Mecox Road in Bridgehampton. A report from Tuesday noted 2 late BUFF-BREASTED SANDPIPERS and a flock of 28 AMERICAN GOLDEN-PLOVERS along with some BLACK-BELLIED PLOVERS and 3 LEAST SANDPIPERS on the sod fields on the western side of Route 105 between the Northville Turnpike and Sound Avenue in Riverhead. The buff-breasts and goldens were not seen the next day. 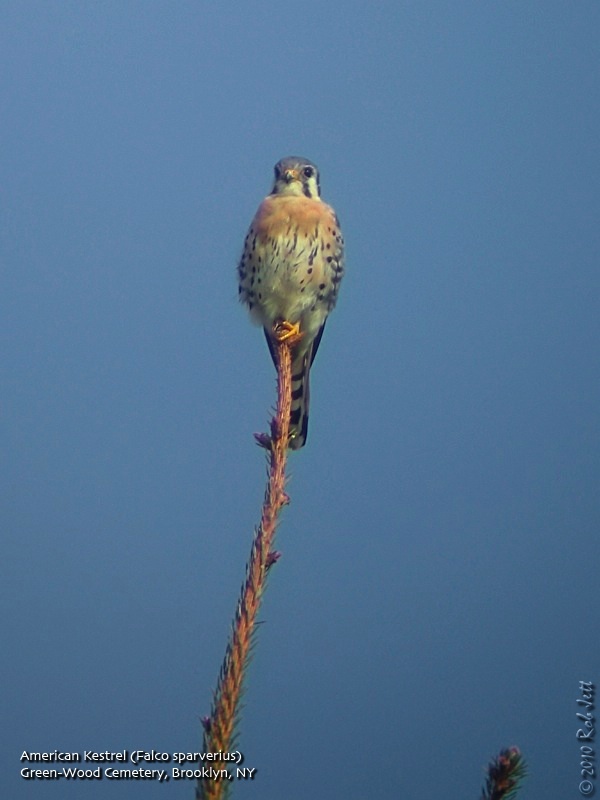 The American Kestrel is the smallest of North America's falcons. Feeding primarily on insects, small mammals and reptiles, they can frequently be seen hovering in place over a field or meadow before diving down to capture their prey. I spotted this individual perched atop a conifer in Brooklyn's Green-Wood Cemetery. This past Saturday I led a trip for the Brooklyn Bird Club today to several coastal areas around Brooklyn. It wasn't a stellar day for birding given very strong north-west winds, but we still had some nice sightings. We started the morning at Dreier-Offerman Park (Calvert Vaux) then headed east to Plum Beach, followed by Dead Horse Bay then finished our day at Floyd Bennett Field. < /embed> . The main soccer fields were being blasted by cold winds off the bay, but there was still a few Killdeer and a Wilson's Snipe hunkered down in the grass. Killdeer are an expected species in this location, but finding a snipe sitting out in the open was unique. Snipes have beautifully camouflaged plumage and observations of them are generally confined to brief flashes of individuals flying away after accidentally stumbling on one. We didn't see a lot of sparrows at this park due to the high winds, but Yellow-rumped Warblers were abundant. In addition, on our way back to the cars, a very brightly plumed Nashville Warbler was spotted foraging a short distance from where we had seen the cuckoo. I didn't plan on spending much time at Plum Beach. Nelson's Sparrow can usually be found in the marsh grass here, so I was hoping to locate one of these orange and gray birds for the group, then run to the next location. Previously known as the "Nelson's Sharp-tailed Sparrow" it was once considered to be the same species at the "Saltmarsh Sharp-tailed Sparrow" and collectively called the "Sharp-tailed Sparrow". Range, genetics and other factors contributed to splitting them into two distinct species. 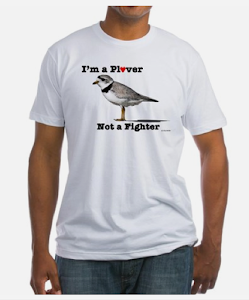 Just recently the two specie's common names were shortened to Nelson's Sparrow and Saltmarsh Sparrow (thank goodness, because saying "Saltmarsh Sharp-tailed Sparrow" took waaay too much effort). Anyway, we found two Nelson's Sparrows at Plum Beach faster than you can say "Nelson's Sharp-tailed Sparrow". The trail from Flatbush Avenue to Dead Horse Bay was active with Yellow-rumped Warblers, a few chickadees and some sparrows. Before reaching the beach I spotted an Osprey hovering over the bay. I wondered about the kinds of toxic substances that would be present in any fish he might catch at Dead Horse. Fortunately, he didn't snag anything this time. It was pretty much the same for us birders - there were no birds at the bay. It was noon by the time we got to Floyd Bennett, so there wasn't much sparrow activity at the community garden, just lots and lots of yellow-rumps. We did spot one male Purple Finch. The winter finch forecast calls for lots of Purple Finches this year. 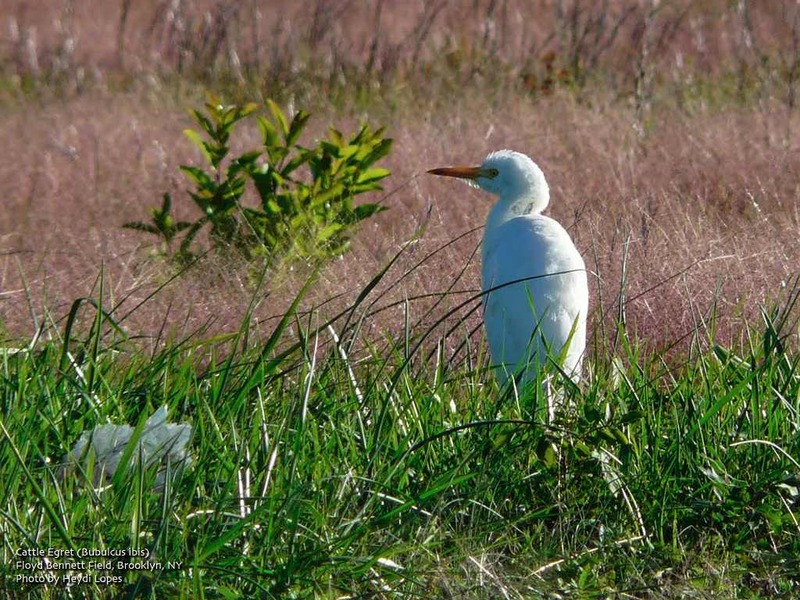 A single Cattle Egret remains on the main grasslands making this nearly two weeks since it was first spotted. We watched it drinking from a small puddle next to a NPS truck. At the Return-a-Gift Pond there were several Green-winged Teal, three Wood Duck and a single Northern Pintail. There was a lot of raptor activity all day, with many Sharp-shinned Hawks seen at all locations. Other raptor species observed were Osprey, Northern Harrier, Cooper's Hawk, Red-tailed Hawk, American Kestrel, Merlin and Peregrine Falcon. When sitting down to breakfast on Sunday morning, I noticed we had a visitor outside the window. Guide: Andrew Baksh or Urban Park Rangers. With the Van Cortlandt Park Conservancy, NYC Department of Parks and Recreation, and Urban Park Rangers. Meet at Van Cortland Nature Center. The history of birding and Van Cortlandt Park are inseparable. Influential birders such as Roger Tory Peterson and Allan D. Cruickshank got their starts on Van Cortlandt’s ecologically diverse grounds. These walks celebrate the tradition set forth by these great ornithologists. Participants will look for various species of migrants and discuss a wide range of avian topics. For more information, please call 718-548-0912. No registration necessary. No limit. Free. 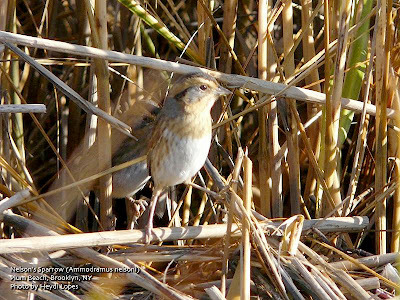 Saturday, October 30, 9:00 a.m. to 11:00 a.m.
Come join Howie Fischer for a walk through the grasslands of Mount Loretto as he searches for late season migrants in the fields and wetlands. At this time of the year, we may see a variety of waterfowl and some raptors as well as the early wintering birds that start to arrive in late October. Meet in the Hylan Blvd. parking lot across from the CYO Center. Please bring binoculars and be prepared for some wet trails along the way. For more information call Howie Fischer at 718-981-4002. Saturday, October 30, 9:45 a.m. to 3:30 p.m. Enjoy walking ten, moderate miles at a comfortable pace to see wonderful vistas, beautiful, fall woodlands and hear the latest information about the imperiled Pouch Camp property. The walk will boarder the property and discussion will focus on what PPOW members and the public can do to support the preservation and conservation of the 143 acres of colorful woodlands. Meet at the corner of Renwick Avenue and Staten Island Blvd., underneath the SI Expressway. Bring lunch, a beverage and sturdy walking shoes. For more information call Dominick Durso at 718-967-0379 or Chuck Perry at 718-667-1393. Saturday, October 30, 2:00 p.m. to 4:00 p.m.
We'll stroll along Old Mill Road, a newly designed multi-use trail, next to Fresh Kills, below the hills of Latourette Golf Course and return along the Blue Trail. We will be surrounded by beautiful, old woodlands as well as newly grown stands of cottonwoods and other pioneer plants. We will see the flow of the famous Hessian Spring as it crosses the road and view Fresh Kills estuary. Parking can be found at the end of Old Mill Road behind St. Andrew’s Church in Richmondtown. For more information call Clay Wollney at (718)869-6327. Learn the myths and facts about creepy crawly creatures. Bring your digital camera and learn how to record the rich fall colors. Greetings. 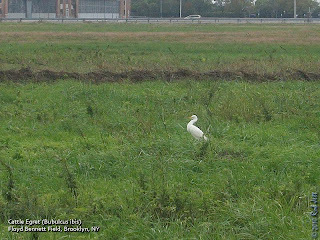 This is the New York Rare Bird Alert for Friday, October 22nd 2010 at 8pm. The highlights of today's tape are a friendly PROTHONOTARY WARBLER, MARBLED GODWIT, EURASIAN WIGEON, PARASITIC JAEGER, CLAY-COLORED SPARROW, DICKCISSEL, BLUE GROSBEAK and many other Fall migrants. In a week enjoying 2 good flights with one earlier in the week followed by another today certainly the biggest surprise of the week was a male PROTHONOTARY WARBLER found Thursday in the plantings around the main entrance of the New York Public Library off 5th Ave. at 41st St. Sometimes the warbler even feeding on scraps on the library's steps, amazing. The city parks enjoyed a nice variety of seasonal migrants this week, many in good numbers, sparrows were well represented with the first FOX SPARROWS appearing and some LINCOLN'S SPARROWS continuing. 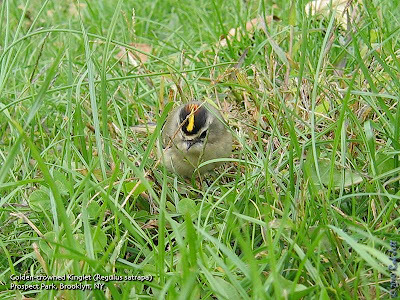 Prospect Park was treated to 3 VESPER SPARROWS on Tuesday when an ORANGE-CROWNED WARBLER was also found there and Wednesday provided such birds as BLACK-AND-WHITE WARBLER, NORTHERN WATERTHRUSH, WOOD THRUSH, BALTIMORE ORIOLE, ROSE-BREASTED GROSBEAK as well as the ORANGE-CROWNED WARBLER. The variety of warblers in Central Park included NASHVILLE WARBLER, a few CAPE MAY WARBLERS, BLACK-THROATED GREEN WARBLER, BLACK-THROATED BLUE WARBLER, NORTHERN PARULA, NORTHERN WATERTHRUSH and WILSON'S WARBLER and other migrants featured BLUE-HEADED VIREO, EASTERN BLUEBIRD, AMERICAN PIPIT and good numbers of PURPLE FINCHES. 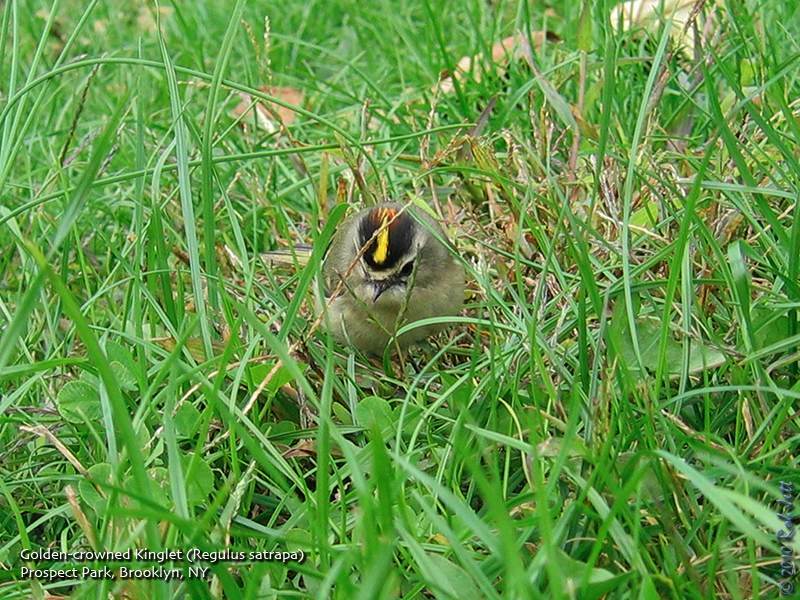 Another ORANGE-CROWNED WARBLER was found in Riverside Park on Tuesday. Many birders venture out to the outer beaches this time of year where the early morning flights under the right conditions can be spectacular with flocks of many species in different families pouring overhead and the ground sometimes covered with sparrows, kinglets, Yellow-rumped Warblers and some hoped for surprises. Robert Moses State Park on the western end of Fire Island has been quite productive lately. Last Saturday an offshore flight included 7 PARASITIC JAEGERS harassing Forster's Terns and Laughing Gulls close to shore and also noted were 225 NORTHERN GANNETS, 3 species of scoters (WHITE-WINGED SCOTER, SURF SCOTER & BLACK SCOTER), and 14 ROYAL TERNS. The SHORT-EARED OWL near field 5 was followed on Sunday by 2 near the golf course at field 2. On Sunday the early morning flight featured 28 PINE SISKINS, 65 PURPLE FINCHES plus some species such as AMERICAN PIPIT, EASTERN MEADOWLARK and RUSTY BLACKBIRD and a CLAY-COLORED SPARROW was found at field 2. On Monday a BLUE GROSBEAK appeared as Moses field 2 with a VESPER SPARROW there Thursday and a LESSER BLACK-BACKED GULL on the field 2 parking lot today. SNOW BUNTING was also noted Monday. Jones Beach West End often mirrors the Moses flight with some differences including more shorebirds. Last Sunday a MARBLED GODWIT was present again with many AMERICAN OYSTERCATCHERS and a few "Western" WILLETS on the bar off the Coast Guard Station with an AMERICAN GOLDEN-PLOVER there Wednesday. Also on Wednesday a PARASITIC JAEGER and 2 ROYAL TERNS were spotted offshore and 4 LAPLAND LONGSPURS appeared around the swale in front of the West End field 2 concession building and 2 just flying by. Morning flights at Jones Beach West End have also featured some AMERICAN PIPITS, many PURPLE FINCHES and lesser numbers of PINE SISKINS. On Monday 2 WHITE-RUMPED SANDPIPERS and a COMMON EIDER were present at West End and a LESSER BLACK-BACKED GULL was on the field 2 parking lot Wednesday with a VESPER SPARROW by the West End turnaround today and a few thousand TREE SWALLOWS have recently been hawking insects over the dunes there. On Sunday a LAPLAND LONGSPUR was at the rock pile at Point Lookout Town Park and 12 PINE SISKINS were feeding in a pine at Gilgo the same day. At Fort Tilden last Sunday there were 2 VESPER SPARROWS in the community garden and a YELLOW-BREASTED CHAT nearby and other migrants included 3 ROYAL TERNS, 20 PINE SISKINS, 100 PURPLE FINCHES plus RUSTY BLACKBIRD. A DICKCISSEL outside the visitors center at Jamaica Bay Wildlife Refuge Tuesday was a highlight there. Some SNOW GEESE have also arrived at the bay that day while a HOODED WARBLER visited a Broad Channel home on Wednesday. Two AMERICAN GOLDEN-PLOVER were on the beach off parking field 8 at Heckscher State Park Monday other reports included 2 FOX SPARROWS, 2 LINCOLN'S SPARROWS and a WINTER WREN at Caumsett State Park Monday and another VESPER SPARROW at David Weld Sanctuary at Nissequogue on Sunday. At Rockland Lake State Park in Rockland County a EURASIAN WIGEON was found last Sunday and single ROUGH-LEGGED HAWKS flew by at adjacent Hook Mountain on Sunday and Wednesday. I love Golden-crowned Kinglets. At this time of year they appear in just about every corner of the city. When I ride my bicycle south to the coast, I hear their high-pitched "tsee, tsee, tsee" call in neighborhoods all along the way. Smaller than a chickadee, their hyperactive behavior matches their near continuous chatter, presumably to keep in touch with the rest of their flock. Most of the warblers have passed through the city on their southbound migration. The exception being Yellow-rumped Warblers and Palm Warblers, which are still being seen in fair numbers. With most of the botanics going to seed, it makes sense that sparrows are now being seen in increasing numbers. I wasn't able to do any birding over the weekend, but managed to squeeze in a little time on Tuesday afternoon. 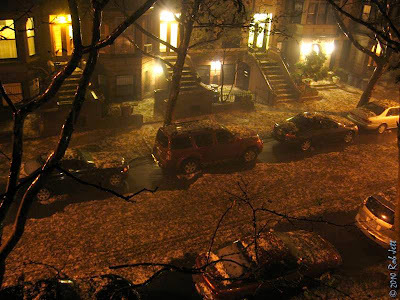 Sean called me Tuesday morning to say that in his town in New Jersey he had heard a tremendous number of bird flight calls passing overhead the previous night. 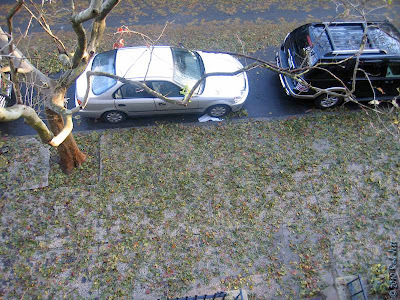 He was heading out to see what had dropped in that morning and recommended that I do the same. My route through Prospect Park at this time of year skirts the edges of all the wooded areas and I concentrate most of my efforts in and around the park's fields and meadows - sparrow habitat. As I headed towards the fenced off area at the South end of the baseball fields I heard lots of Golden-crowned Kinglets. Some were foraging in the trees, but many were actually hopping around in the grass, gobbling up some tiny, unseen invertebrates. Several phoebes are still around and hawked for insects from low perches. At the south end of the ball fields a huge, swirling flock of sparrows moved like a wave through a stand of linden trees. A group of cawing crows near the edge of the fencing seemed to have spooked the little birds. I waited for the sparrows to settle down and return to the grass. The birds eventually started to make their way back to the freshly seeded section of lawn. The flock was primarily composed of Dark-eyed Juncos with a slightly small number of Chipping Sparrows. As I scanned the birds it became, at times, a little frustrating because the birds were routinely being spooked by, first, a Red-tailed Hawk, then a Merlin made several passes over the area and, just in case the small songbirds weren't paying attention, a Cooper's Hawk buzzed them. Before I left the house I had received a text message that Rob Bate had spotted a Vesper Sparrow by the ball fields. Vesper Sparrows have been declining as a breeding species in New York State and is uncommon along the coast during migration, making it a very desirable find in New York City. When I was circling the perimeter of the fenced off area I ran into Larry and Shari, who had also gotten word of the rare sparrow sighting. A few minutes later we were joined by Peter, who was on his lunch break. We searched through the juncos and chippings looking for the oversized sparrow. At the north edge of the fence we scanned a small group of Savannah Sparrows. After only a few minutes, I spotted the Vesper Sparrow as it perched on top of the fencing. Rob arrived just as the three other birders were departing and we continued to scan the approximately 500 sparrows in that area for any other rarities that might have been overlooked. We found a single White-crowned Sparrow, but nothing out of the ordinary. Just as I was about to give up I spotted a second Vesper Sparrow. At one point the two birds were feeding together. Tom Stephenson, who had been trying to photograph an Orange-crowned Warbler at the other end of the park, joined Rob and I at "sparrow central". After several minutes we left the fenced in area and walked north along the Long Meadow towards the "Sparrow Bowl". As soon as we arrived I spotted another Vesper Sparrow feeding near a badly worn stretch of grass. This was the first time that I've even seen more than one Vesper Sparrow in a single day! The total sparrow count for Prospect Park for the day (including birds that I didn't see) was 7 species, far short of our 13 species sparrow fallout on October 23rd of last year, but a great afternoon, nonetheless. Guide: Andrew Baksh or Urban Park Rangers. With the Van Cortlandt Park Conservancy, NYC Department of Parks and Recreation, and Urban Park Rangers. Meet at Van Cortland Nature Center. The history of birding and Van Cortlandt Park are inseparable. Influential birders such as Roger Tory Peterson and Allan D. Cruickshank got their starts on Van Cortlandt’s ecologically diverse grounds. These walks celebrate the tradition set forth by these great ornithologists. Participants will look for various species of migrants and discuss a wide range of avian topics. For more information, please call 718-548-0912. No registration necessary. No limit. Free. 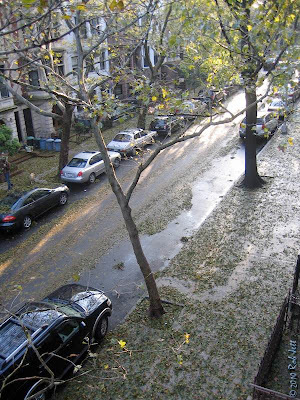 Sunday trip site will be given at time of class on Wed. 10/20 (Class to be held at NYC Audubon, 71 W. 23rd St., Ste. 1523). Saturday, October 23, 2:00 a.m. to 4:00 p.m.
We’ll begin with a look at the local geology then move to examining the flotsam and jetsam accumulated at the high tide lines to see what nature's debris has to tell us. As the water recedes with the tide we'll move into the intertidal zone to find out what sorts of living things survive in this challenging environment. 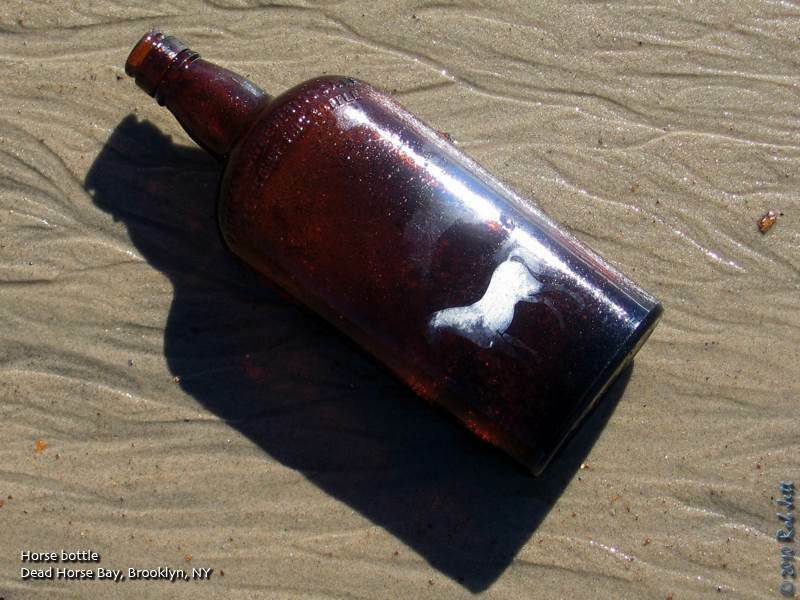 A variety of crabs, snails, clams, worms and small fish are likely to be discovered. It's going to be muddy so dress appropriately. Meet at the parking lot at the bottom of Page Avenue below Hylan Blvd. 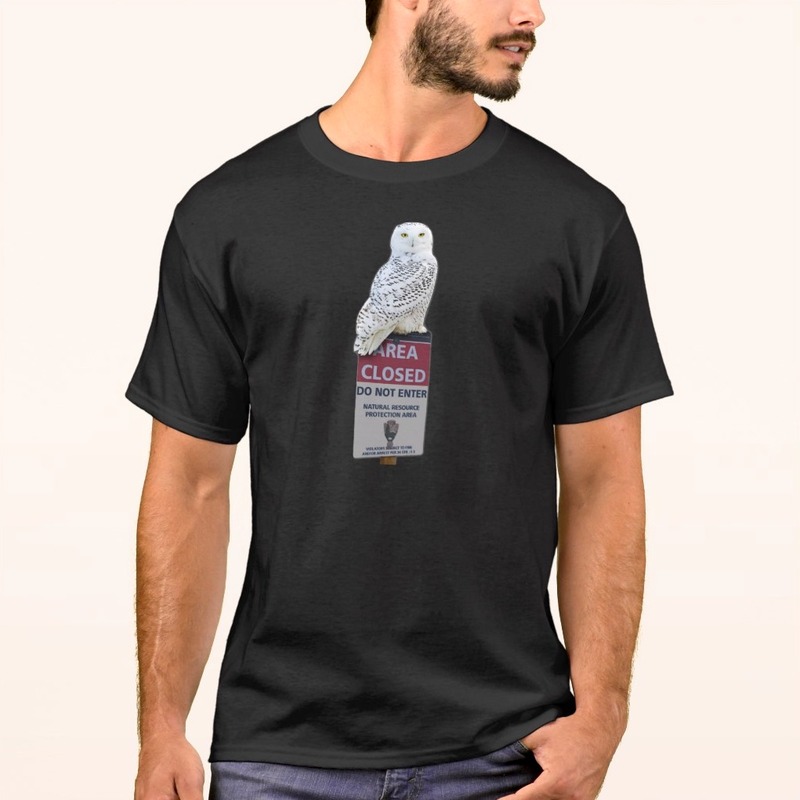 Saturday, October 23, 7:00 p.m. to 9:00 p.m.
Join Cliff Hagen to seek out and discover the owls of Pouch Camp. We will walk the trails of the Greenbelt that boarder the Boy Scout property. At times, Cliff will mimic the calls of local owls. With good luck and patience, participants will be able to hear, and maybe see the owls drawn out of the Pouch Camp property. Meet along Nevada Avenue just before entering the High Rock parking lot. Sunday, October 24, 12:00 p.m. to 2:00 p.m.
Join Sandra Mechanic, naturalist and photographer, on the Manor Road side of Susan Wagner High School. Walking here can be tricky; wear waterproof footgear even if it is not raining. Bring a walking stick. We will explore old ancient trees and plants. This is an exciting walk because few have trodden through this area. We will look for oyster mushrooms (pleurotus ostreatus and p. populinus) growing in clumps on the trunks of trees. Oyster mushrooms' caps are whitish, fan-shaped, 1 to 12 inches wide and about 1 inch thick. They overlap each other as they grow in clusters. Pleurotus populinus grows only on dead poplar trees during late May through early June, while p. ostreatus grows on live sugar maples, beech trees or other hardwoods during October through mid-December. For more information call Sandra at (718) 967-1037. Witness the wonders of meadowhawks as they land on your hand. This genus of small red dragonflies remain active into the cool days of late fall. Held at Long Pond Park. Meet in front of PS 6 on Page Avenue. For more information call Seth Wollney at (718) 483-7105. Greetings. This is the New York Rare Bird Alert for Friday, October 15th, at 10:00pm. The highlights of today's tape are AMERICAN AVOCET, MARBLED GODWIT, BLUE GROSBEAK, CLAY-COLORED SPARROW, NELSON'S SPARROW, PINE SISKINS, and LAPLAND LONGSPURS. Modest flights last weekend and into the early part of this week continued to provide some good variety, especially along the coast, and the appearance of some PINE SISKINS starting last Sunday from Riis Park to Robert Moses State Park and even out in Montauk indicate that we should see at least one winter finch this winter. At Jones Beach West End, the recent emphasis seems to have been on shorebirds, with a Monday visit by an AMERICAN AVOCET on the island off the Coast Guard Station, preceded by a MARBLED GODWIT joining the flock of American Oystercatchers there on Sunday. Shorebirds in the swale between the West End 2 pavilion and the ocean on Saturday featured one LEAST SANDPIPER, six WHITE-RUMPED SANDPIPERS, and seven PECTORAL SANDPIPERS. A CLAY-COLORED SPARROW was at the West End turnaround on Monday, followed by a LAPLAND LONGSPUR at West End parking lot 2 on Wednesday. 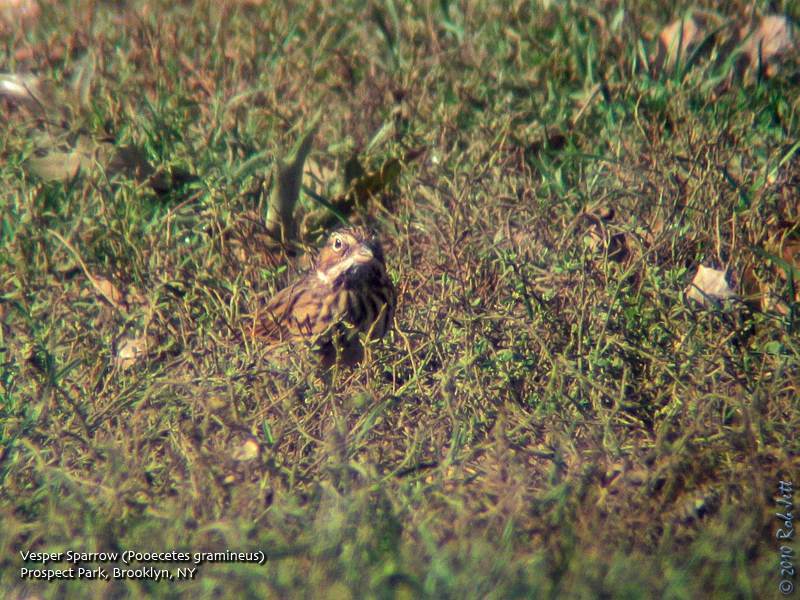 Another LAPLAND LONGSPUR was seen Sunday along the edge of Gravesend Bay, south of the Verrazano Bridge in Brooklyn. There was no sign of last Friday's WESTERN KINGBIRD at Riis Park on Saturday, but there was a YELLOW-BREASTED CHAT there on Sunday, and adjacent Fort Tilden also contributed some nice finds, featuring a BLUE GROSBEAK and an inland form of NELSON'S SPARROW just west of the Community Garden, plus a BLACK-BILLED CUCKOO on Saturday, while Sunday added a CATTLE EGRET. This species was also noted at Floyd Bennett Field on Sunday. On Wednesday a nice count of 110 EASTERN PHOEBES were tallied along the Jones strip to Robert Moses State Park, with 12 PINE SISKINS also noted. And a BLUE GROSBEAK was found at Moses Park, parking field 5. Other interesting city area birds have been a GRAY-CHEEKED THRUSH in Bryant Park, Manhattan, last Saturday, and in Central Park Wednesday a COMMON RAVEN well overhead, and a visit by two AMERICAN PIPITS, the latter a species now much more regular along the outer beaches. Another COMMON RAVEN was spotted at Sands Point Preserve on the North Shore of Nassau County. Out East at Montauk Point Saturday produced 30 WHITE-CROWNED SPARROWS and a couple of LINCOLN'S SPARROWS, plus a RUSTY BLACKBIRD, while Sunday found 13 COMMON EIDER and some scoters offshore, plus such seasonal migrants as AMERICAN PIPIT, PURPLE FINCH and BOBOLINK. Roosevelt Third House County Park in Montauk yielded a DICKCISSEL. On the North Fork an ORANGE-CROWNED WARBLER was found in a Cutchogue field last Saturday, and we understand that the GLAUCOUS GULL was still around the Orient Point Ferry Terminal recently. 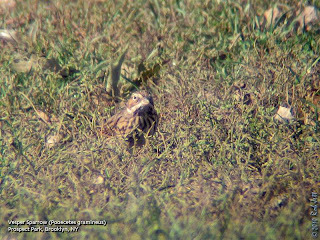 In Westchester an AMERICAN GOLDEN-PLOVER appeared last Sunday at Marshlands Conservancy, where some NELSON'S SPARROWS are also present. I needed to work off the massive amounts of food that I consumed at the Octoberfest. 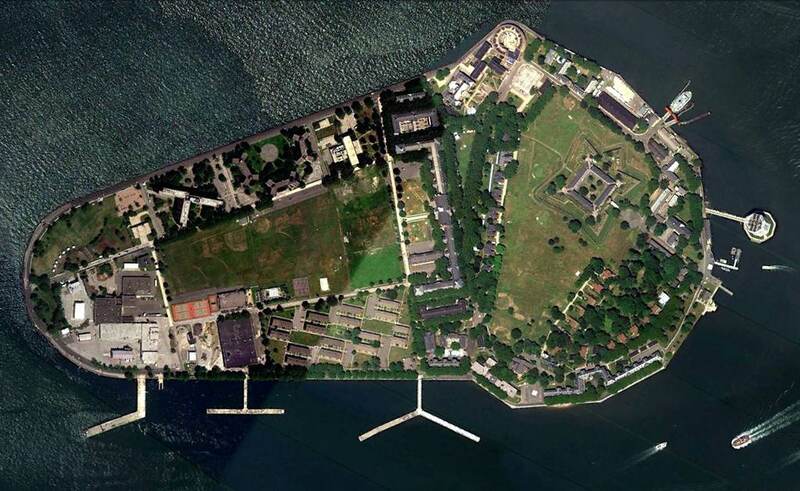 A long bike ride down to Floyd Bennett Field would do the trick. As we were getting ready to leave the house, Heydi texted me that she was looking at a Cattle Egret in the community garden at Floyd. Cattle Egret had been sort of a jinx bird for me for several years. I always seemed to be hearing comments like, "One was just here a few minutes ago. You didn't see it?" Unlike my real, former jinx bird, the Golden Eagle, which is uncommon on migration, Cattle Egrets are listed as breeding in NYC and upstate NY. I guess I was always just in the wrong place at the wrong time. Last November I assumed my losing streak was over when Heydi pointed one out that was foraging in the grass at Floyd Bennett Field. On Sunday morning I replied to her text message, "Ask him to wait around for me." It took a little longer than expected to get to Floyd Bennett as I had to fix a flat tire. 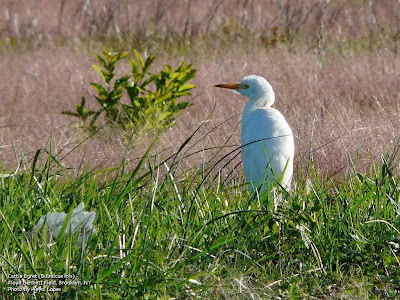 Fortunately, the Cattle Egret got my message and was still hunting for insects within Floyd Bennett Field's grassland when Robin and I arrived. The egret seemed unperturbed by a pair of kestrels that were hunting above the fields. While I was taking pictures of the small, white heron, three calling American Pipits landed in the field. They were the first of the season for me and a sure sign that all of our expected winter species were close at hand. 16 Structures Go - Flames Not Checked Early Today. 600 Families Flee in Boats to the Mainland - The Plants May Not Be Rebuilt on the Island. 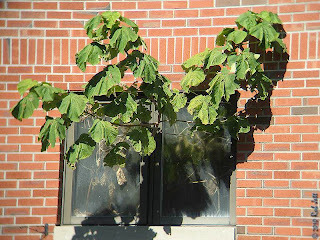 The two great plants on Barren Island where the refuse gathered in Manhattan and Brooklyn is disposed of were burned to the ground yesterday by a fire which started just after 1 o'clock in the afternoon. The flames started in one of the buildings known as the "digester building." This was a three-story brick structure at the east end of Barren Island, near the entrance to Jamaica Bay. The building extended along the wharfs of Rockaway Inlet for 500 feet and was 200 feet deep, large enough to cover two city blocks. From this building the flames spread rapidly to seven other big structures, which were completely wiped out, leaving the city without a refuse plant. The fire kept spreading all day, and the wharves along the Inlet end of Barren Island caught fire just before midnight. At that time the city's fireboat was at work with several streams, trying to save the buildings along the southeast shore of the island. These are the buildings formerly used for disposing of the city's dead animals, and were known as the "horse buildings." At midnight the flames had caused a damage of $1,500,000 and was still raging in the island's store houses, where 20,000 bags of fertilizer were in flames. It was said early this morning that the fire had destroyed at least sixteen buildings large enough to be dignified with such a name. Besides these, a dozen or more sheds and shanties had fed the flames. It was reckoned that sixteen acres of buildings had been burned. The fire could be seen for many miles at sea and from all the seaside beaches about New York, where crowds bent on pleasure stood for hours watching the progress of the flames, believing they were eating up several big ships. The city's firemen made very little attempt to check the blaze, as they were unable to get fire engines over to the island. The fireboat Seth Low, however, did some work at the island. That was about all that was attempted In the way of fighting the flames, as the firefighting plant owned by the Barren Island contractors was burned up early in the day. The property destroyed was owned by the New York Sanitary Utilization Company and Frank White, whose father-in-law was the originator of the scheme to dispose of the city's refuse on Barren Island. Christopher Behlln, a watchman employed by the White concern, discovered the fire while making his rounds in the "digester plant," where the city's refuse is boiled. There were 150 steel tanks In this building. Many of them were filled with oil, which burned rapidly when the flames spread to the woodwork about the tanks. Before the watchman had time to turn in an alarm to summon the COO men who live and work on Barren Island the flames were leaping through the roof of the building. Then they jumped to the pump house, a three-story frame structure, equipped with apparatus for fighting fire. By the time the volunteer firemen arrived they found they could do nothing, as the pump house was in flames. The pumps, which were used to force salt water through pipes, could not be reached by the firemen, and all they could do was to stand by and see the flames eat up one building after another. Then when the Brooklyn refuse building began to burn the people living on Barren Island began to look about for a means of escape, as they feared their homes were doomed to go. Six hundred families packed up their valuables as quickly as possible and climbed into boats. All sorts of craft, tied to the piers about the island, were brought into use. There were launches, naphtha launches, rowboats, yawls, sloop yachts, and scows. 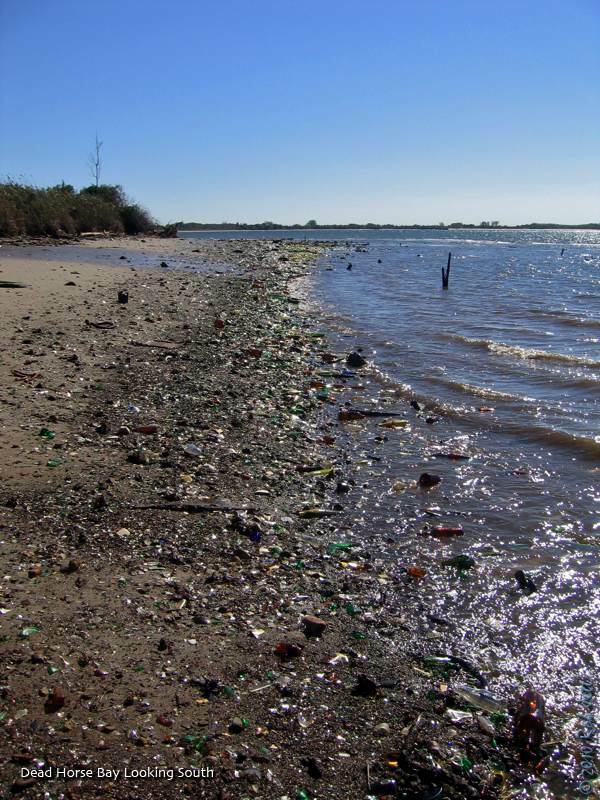 The residents of the island's Polish, Bohemian, and Italian men, women, and children piled pellmell into the boats, carrying all sorts of household articles with them. Some of them even took their carpets. Clocks, bedding, and looking glasses, however, seemed to be the popular things to rescue. Almost every resident of the island took these things with him before abandoning the little shanties in which the families lived. In the rush for boats several persons tumbled Into the Jamaica Bay waters, but all were rescued. One woman carrying a parrot and a marble clock fell into the water from the West End pier. She was dragged out by her husband, who scolded her In Bohemian because she had let the clock and parrot go. 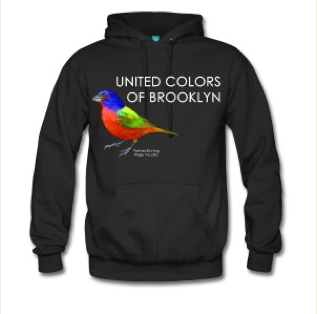 The parrot was rescued by a boy in a row boat and taken to Canarsie. Most of the people who fled from Barren Island went to Canarsie in the boats they had seized. After being assured later in the day that there was no danger of the fire spreading to the dwellings on the island, many of the women and children were taken back. With them went the woman who had lost her clock overboard. She, and her husband obtained fishing tackle and lowered hooks and sinkers, fishing for the marble clock, while the fire raged in the buildings of the plants. The big frame boiler buildings were swept away by the flames, together with the machine shops and the hydraulic press plant, before the fireboat arrIved. The delay in getting the fireboat was explained by a fireman, who said that the boat had never been at Barren Island before, and had to find a skilled pilot before attempting to enter Rockaway Inlet. In the hydraulic press plant there were fifty-two hydraulic presses, each valued at $3,800, so that the damage there amounted to $200,000. All the presses being ruined. The big derricks and rigging along the docks for half a mile were also destroyed, and the wreckage from them fell into the bay. The drying plants, which occupied two great buildings a city block long, were burned to the ground. Then the fire, crept over to the storehouses. Twice the roofs of the horse buildings, half a mile away, caught fire, but the crew of the Seth Low stamped out the fire there both times. Owners Rush to the Island. When the news of the fire reached this city, E. J. McKeever, the owner of the remaining plants on Barren Island, chartered a steamboat and with his brother, who is his partner, hurried to the island. They had been told that their plant had been wiped out, but on reaching the island found that the fire had not extended to their plants. They were in danger, however, so the McKeevers pressed into service all the men they could find, about 400, and set them to work wetting the roofs of their building with several streams pumped up by six tugboats. The McKeever Brothers own what is said to be the largest fertilizing plant of the sort in the world, and it was said last night that if they succeeded in saving it they would be able to help out the city greatly by disposing of the city's refuse until a new plant can be erected on Fire Island. Early this morning it was calculated that the fire had wiped out sixteen acres of buildings, many of them brick, which will probably not be rebuilt. The tall brick chimney which was a landmark on Barren Island and which could be seen twenty miles out at sea, tumbled to the ground an hour after the fire had started, and the big building which it had shadowed for many years was left a mass of crooked, twisted iron. Last Saturday was Octoberfest on Governor's Island. It was also the last weekend that the general public would be able to visit the island until next year. 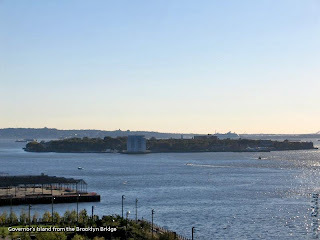 German food and beer is always enticing, but exploring the island and looking for Fall migrants was also a good reason to hop the free ferry from lower Manhattan. 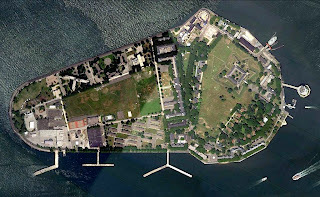 The 172-acre island is about 1/2 mile from the southern end of Manhattan, but much closer to Brooklyn. Legend claims that some Brooklyn farmers would drive their cattle across Buttermilk Channel at low-tide to allow them to graze on the island. Judging by the size of the cruise ships that now dock on the Brooklyn side of the channel, it has been dredged considerably over the decades. 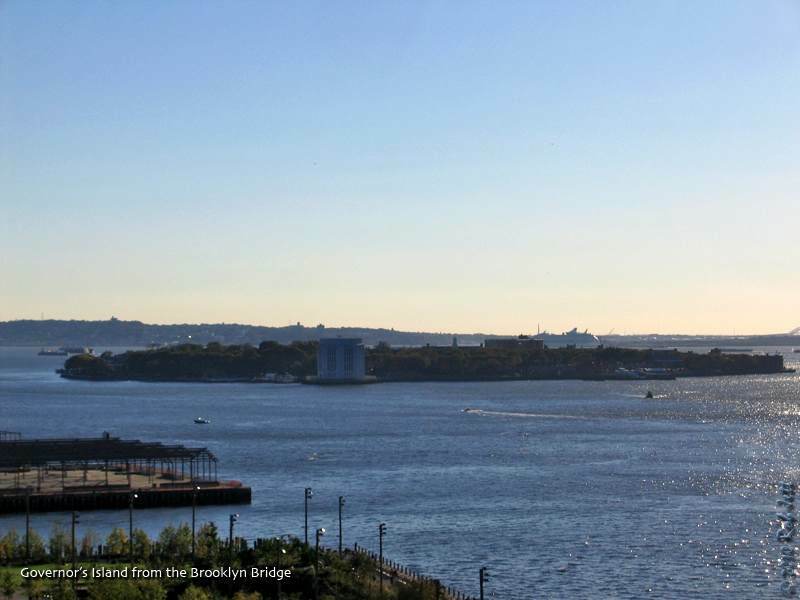 The island can be seen looking south from the Brooklyn Bridge promenade. 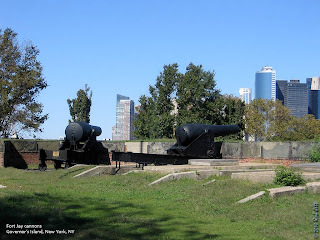 Straight up the hill from the ferry terminal is Fort Jay, it's cannons still standing vigil over lower New York Harbor. Drained of water, the fort's moat is now grassy habitat, as is the entire hillside and adjacent parade ground. As we walked through the meadow I noticed wary chipping and White-throated Sparrows foraging in the shadow of trees that dot the edges of the grass. They never strayed far from the protection of the tree's still dense foliage. Northern Flickers leap-frogged each other as they moved from tree to tree. Perched on the wind vane atop Liggett Hall was an American Kestrel. The small, colorful falcon faced the expansive stretch of grass, no doubt watching for a careless sparrow or large grasshopper. Flitting low across the meadow were several Common Buckeyes. Monarchs were migrating in good numbers high above the field. On the west side of the island, and in sight of the Statue of Liberty is a 3-acre urban farm. At the northern end of the rows of produce I also noticed a pair of apiaries. I spent about 15 minutes walking the edges of the vegetable and flower columns, scanning for birds. It wasn't until I got to the northern end of the plots that I flushed up lots of birds. The flock was mostly White-throated Sparrows, but I also spotted Winter Wren, Golden-crowned Kinglet, Palm Warbler, Yellow-rumped Warbler, Swamp Sparrow, Chipping Sparrow and Savannah Sparrow. Like the sparrows on the meadow, I suppose these birds were staying close to the safety of a row of shrubs and small trees. On the Buttermilk Channel side of the island we came across a nice mixed flock of songbirds in an ash tree. As had been the case for the last week or so, a majority of the birds foraging in the leaves were kinglets, but we also observed Eastern Phoebe, Red-eyed Vireo, Red-breasted Nuthatch, Blackpoll Warbler, Palm Warbler, Northern Parula and Yellow-rumped Warbler. Stone, softer than the surrounding mortar, has started to dissolve, leaving a raised maze of cement. 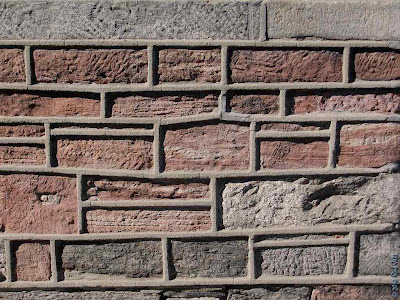 This is a photo of the lower wall of one of the officer's quarters within Fort Jay. At around 8:30pm on Monday, the wind began blowing so hard that I thought our windows would pop out of their frames. 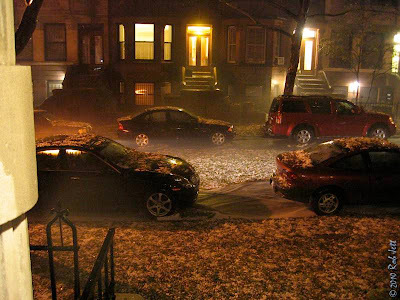 Moments later the hail began. 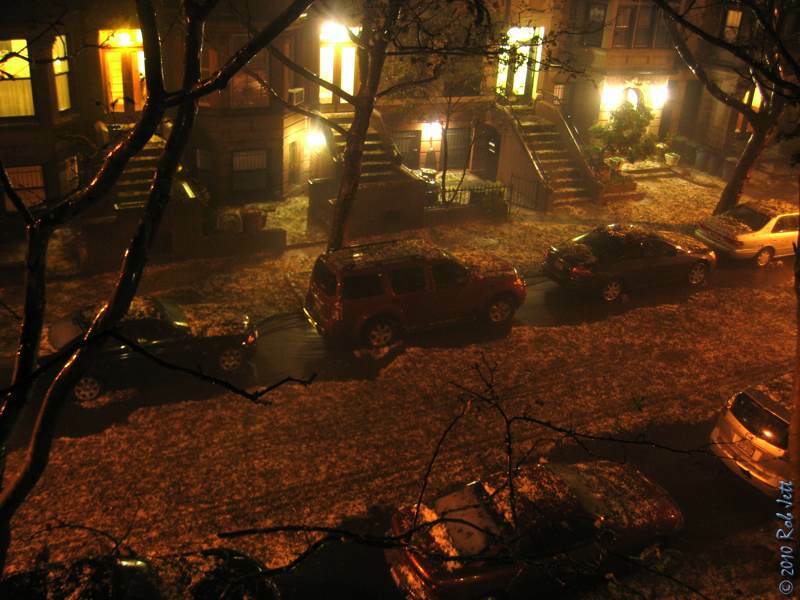 At first, I wasn't even certain it was hailing because I couldn't see the ground through the curtain of rain and swirling leaves. I grabbed my camera and ran down to the front door. 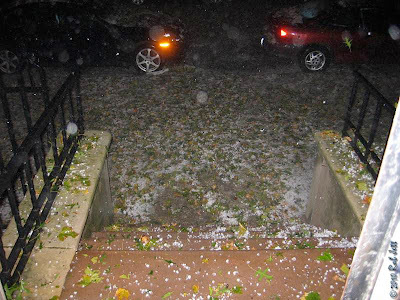 Here are a few photos of the marble-sized hail. Birding and biking, a natural combination! Join us in an eco-friendly excursion. 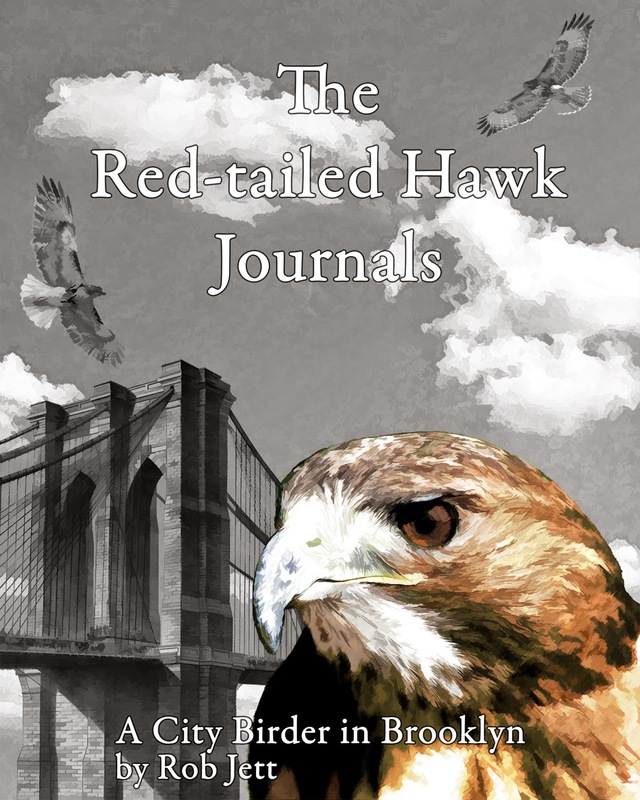 Meet at the Columbus Circle entrance to Central Park at 59th St., then ride the west side bike route up to the George Washington Bridge, and then across into the Palisades Park where we will look for hawks and other birds. The bike route will cover over 20 miles; riders have the option of taking public transportation home from the Washington Heights area. Limited to 15. Bring lunch, water and binoculars. Saturday, October 16, 2010, 10:00 a.m. to 2:00 p.m.
Meet in the Nevada Avenue parking lot of High Rock. We will go to the Blue and Yellow Trails north of the Loosestrife Swamp to remove the invasive, alien Devil’s Walking Stick and cut alien twining vines from saplings along the trail. If you don’t have your own, Protectors will supply gloves and pruners (& refreshments). After a two hour work session (our 172nd consecutive monthly workshop), we will take a short walk over nearby trails. Explore the colors that autumn brings to this park. Greetings. This is the New York Rare Bird Alert for Friday, October 8th, at 8:00pm. The highlights of today's tape are BROWN BOOBY, CORY'S SHEARWATER, CATTLE EGRET, SHORT-EARED OWL, BICKNELL'S THRUSH, SUMMER TANAGER, BLUE GROSBEAK, DICKCISSEL, LARK SPARROW, CLAY-COLORED SPARROW, and CONNECTICUT WARBLER. In another week of enjoyable variety, we first have the saga of the Brown Booby. Last Friday an immature BROWN BOOBY was found in distress in Lynbrook, Long Island, and taken to a nearby rehabilitator. The booby was judged well enough to be released, and on Saturday was set free off the Jones Beach fishing piers, though perhaps an ocean release might have been more appropriate. Later on Saturday the booby was recaptured in Freeport, having struck some sailboat guy-wire and sustaining a broken wing. Now the booby is back at the rehabilitator's for evaluation and treatment. Despite not a lot of migratory movement, the parks around the city produced some nice finds. In Central Park a BICKNELL'S THRUSH was identified at Azalea Pond last Saturday, that same day finding an immature BLUE GROSBEAK at the Great Hill, plus BLACK-BILLED CUCKOO, a YELLOW-BREASTED CHAT (present also on Sunday), and other warblers including TENNESSEE WARBLER and HOODED WARBLER. In Prospect Park Tuesday, a CLAY-COLORED SPARROW was among nine species of sparrows that included LINCOLN'S SPARROW and some WHITE-CROWNED SPARROWS, and a HOODED WARBLER was among the most unusual of that family. 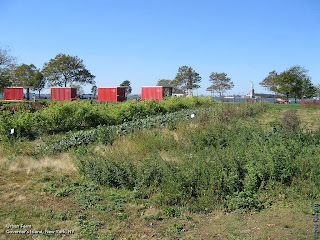 Brooklyn highlights Wednesday included two ROYAL TERNS at Dead Horse Bay, and a BLUE GROSBEAK in the Community Gardens at Floyd Bennett Field. Earlier an ORANGE-CROWNED WARBLER had been reported at Floyd Bennett on Monday, this followed by an ORANGE-CROWNED at Clove Lakes Park on Staten Island on Wednesday. In Fort Tilden a SUMMER TANAGER, seen Saturday and Sunday just north of the ball fields, was a nice surprise, and a CONNECTICUT WARBLER was glimpsed in the same area on Sunday. A DICKCISSEL also flew over Fort Tilden on Saturday, and then today, in that area, a nice flight at Riis Park included a WESTERN KINGBIRD along the fence at the southwest corner of the golf course. In the Jones Beach area, a one-eyed CLAY-COLORED SPARROW was still around the fence line at the West End Coast Guard Station through Sunday, and a LARK SPARROW was reported there Wednesday. Some very interesting West End sightings were a COMMON RAVEN east of the Roosevelt Nature Center on Saturday, and a good high count of 55 WHITE-RUMPED SANDPIPERS in the swale between the West End 2 bath house and the ocean on Tuesday. A YELLOW-BREASTED CHAT was among a good variety of birds Saturday in the rock pile at Point Lookout Town Park. Robert Moses State Park also provided a good variety of birds. Last Saturday a BLUE GROSBEAK and a DICKCISSEL were just west of the field 2 volleyball courts, with a BLACK-BILLED CUCKOO nearby. A pelagic watch off Moses field 2 Tuesday morning noted three CORY'S SHEARWATERS and some unidentified shearwaters, a PARASITIC JAEGER, and three ROYAL TERNS, while on shore were a LESSER BLACK-BACKED GULL in lot 2, and a YELLOW-BILLED CUCKOO. A MOURNING WARBLER was spotted in field 2 Wednesday, while a CATTLE EGRET stayed around field 5 at Moses Park to Sunday. A SHORT-EARED OWL flushed last Sunday at Heckscher State Park was the first for this fall. At Smith Point Park in Shirley last Saturday, a good flight there included DICKCISSEL and ORANGE-CROWNED WARBLER, as well as an AMERICAN GOLDEN-PLOVER with some Black-bellieds, and a LESSER BLACK-BACKED GULL. Some GRASSHOPPER SPARROWS were still present at the former Grumman Airport in Calverton recently. Another BLUE GROSBEAK was reported at Leeds Pond Preserve in Plandome on Thursday. Out at Montauk Point Saturday, besides the distant jaeger off the Point, most of the excitement was on shore. Warblers included CAPE MAY WARBLER and BLACKPOLL WARBLER, and a YELLOW-BILLED CUCKOO appeared, while the Seal Haulout Trail contributed TENNESEE and BAY-BREASTED WARBLERS. And at the Roosevelt Third House County Park a BLUE GROSBEAK was in company with about 10 INDIGO BUNTINGS and 30 BOBOLINKS.